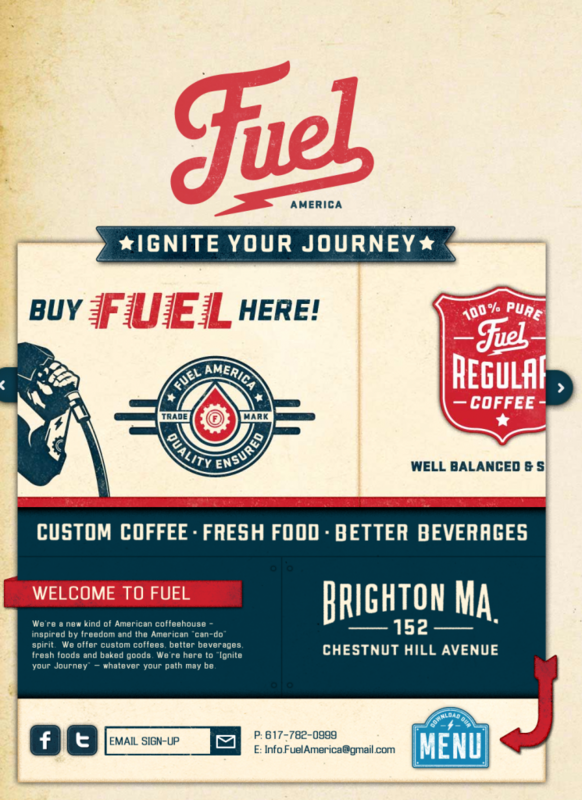 Coffee bags that resemble old motor oil cans, Americana flavoring, and as the designer quips “Coffee for yer Pops.” Fuel America is the brainchild of Commoner, Inc., a Boston-based identity studio that makes logos and trademarks fun again. You could get lost for a while in their Dribbble account, but I recommend it highly. 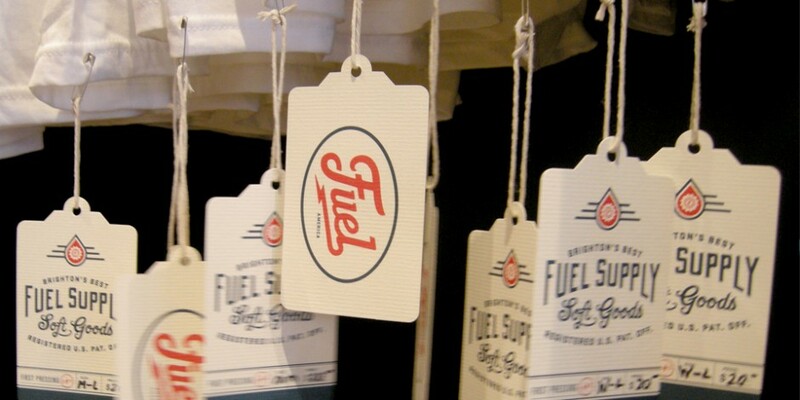 But let’s focus on this one brand identity for a moment, because it’s loaded with great inspiration and solid branding lessons. The website itself is one simple page, with sliders and a downloadable PDF menu (cute button, but would be nice if this could have a text-based component too.) I guess for a simple, single-location coffeeshop there isn’t much else needed at this time, so the simplicity of a single pager loaded with flavor and images of the physical space works very well. 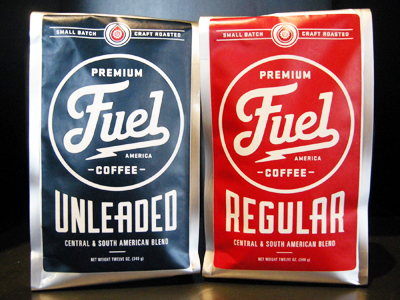 Fuel’s coffee bags were designed to resemble old motor oil packaging. Silver packages just required a gorgeous label to make them sing, and this was a cost-saver since the packaging is so simple. Love these! 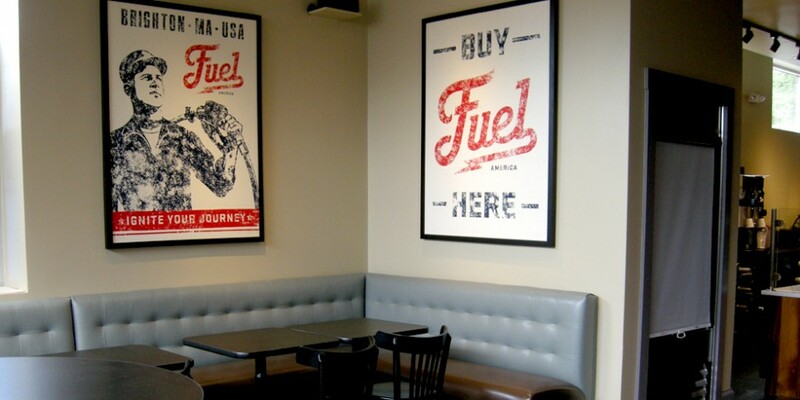 For the walls the designers simply blew up and framed their artwork and it looks fabulous. This is also a pretty major cost savings since the art is cool and was designed for other elements anyway. Great idea. 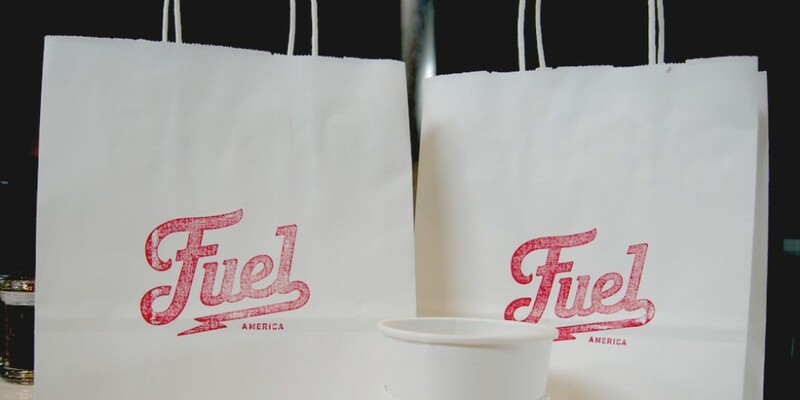 For the purchase of food, tshirts and coffee simple bags with the stamp-like logo on them are cool enough for customers to want to keep and use later. These bags didn’t need a lot of complex art as the grunged effect of the logo provides complexity enough. Not sure if they print these or had a rubber stamp made to customize plain white bags as needed – either approach would work. 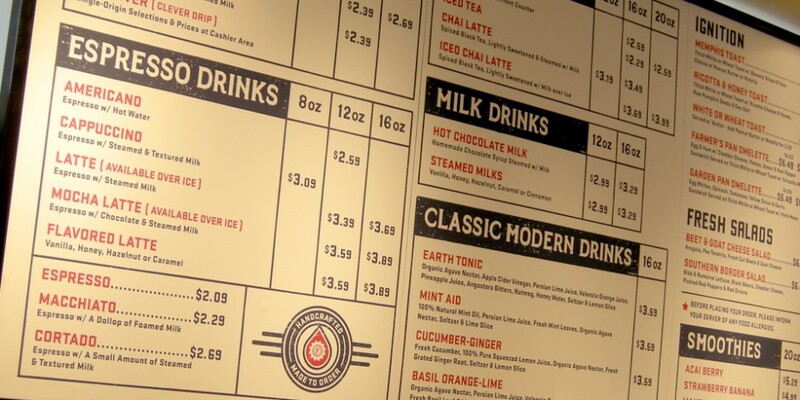 Of course, the menu board is indelibly Fuel and features the upright fonts and trademark symbols that are the hallmark of this brand, in beautiful American red and blue and with the vintage nod of cream background. I’d like a Mint Aid please!